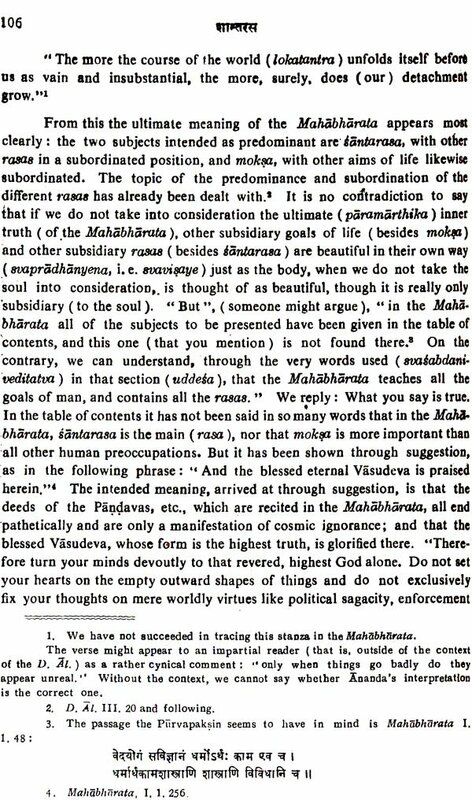 I have great pleasure in writing a Foreword to this book by Prof ..M. V. Patwardhan and Mr. J. L. Masson and in introducing the latter whom I have known intimately for some time and who has struck me with his flair for Sanskrit and its cultivation and for the literary study of Sanskrit literature, qualities which, undoubtedly, he has imbibed from his chief teachers L. Renou of the Sorbonne and Prof. D. H. H. Ingalls of Harvard. His association with these two scholars explains his association with me. This monograph is on Santa Rasa and Abhinavagupta's aesthetics as it emerges out of the philosophy of Rasa as expounded by him. It stems out of my Number of Rasas which at the time of its first appearance in the middle of the forties, was the first detailed exposition of this important subject. 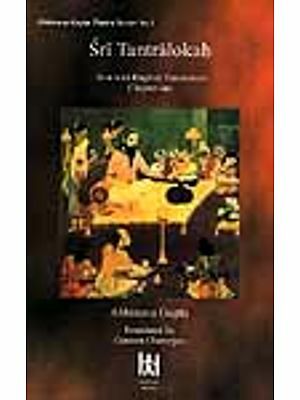 In that work, I had also offered a critical edition of the section relating to the santa from Abhinavagupta's commentary on the Nat)Ja Fiastra. 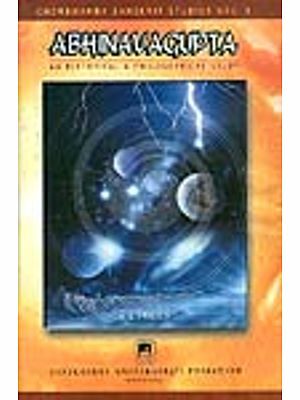 Naturally, while the material given in the present study has already been known, the treatment of the authors has given it a freshness, illustrating the principles of novelty elucidated by Anandavardhana in Uddyota IV of Dhvanyaloka. As Max Muller said, at every stage, a fresh study of a branch of knowledge is required. In the introduction, as also in the main part of their work, the authors have traversed a wide ground in respect of literature and response to it. 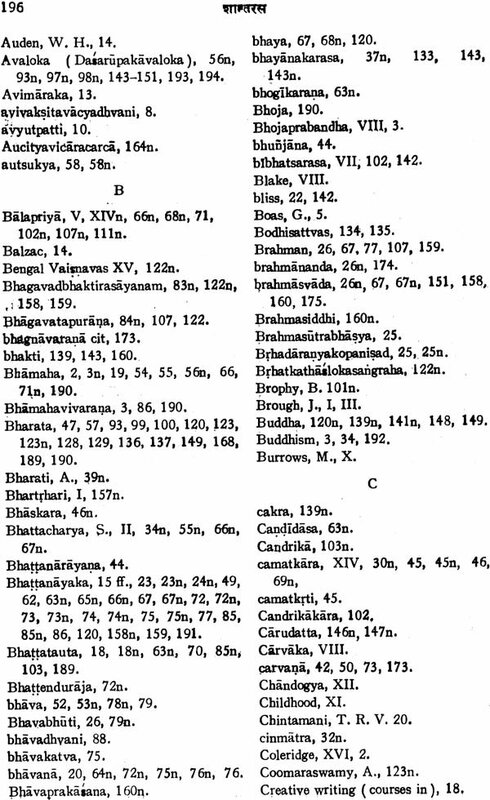 and on the background of the latest writers, critics and philosophers in the West and the attempts of a few of them to interpret or understand the contributions of the Sanskrit writers, they have highlighted some of the most important ideas of Anandavardbana and Abhinavagupta. 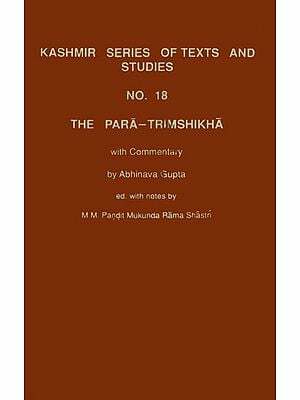 The thought of these two masters of Sanskrit literary criticism, particularly of the latter, is examined on the background of their school of philosophy, Kashmir Saivism, But as they go, the authors take in their stride many other related concepts which involve parenthetical treatment; added to these are the very large number of references to works and authors, but the reader should be able to follow the main theme of the authors namely the conception of Rasasvada as elucidated by the two great aesthetes Anandavardhana and Abhinavagupta. 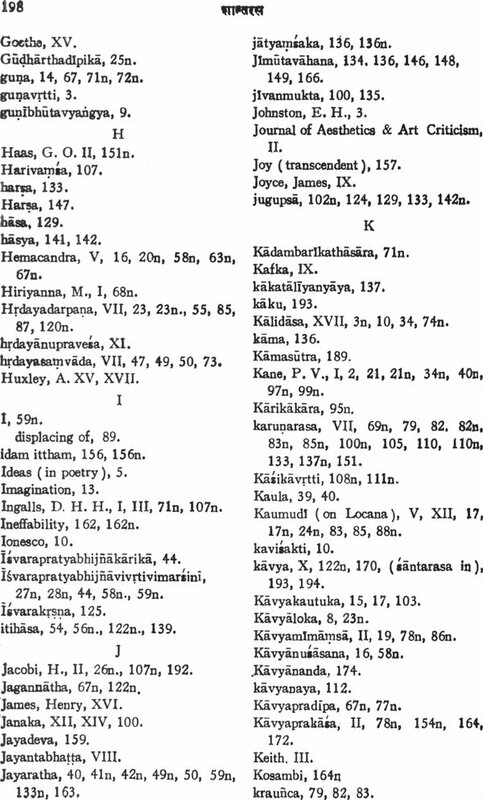 Not only does the study in the following pages show the extensive reading of the authors, but it also expressly mentions a chain of further studies, connected with the present one, which the authors have prepared. As a member of the Indian Advisory Committee of the American Tnstitute of Indian Studies, I am pleased that a Grantee of the Institute, one of the joint-authors of the Volume, has done remarkably well on his grant- programme in India. Quite a few of the younger generation of American scholars are engaged in pure Sanskrit and Siistraic studies, and by assisting them, the Institnte is giving a fillip to Sanskrit studies. The present study grew out of a much larger work that the authors are presently completing. We have both been long interested in Sanskrit literary criticism. Professor Patwardhan has taught the Dhvanydloka and the Rasagangadhara over a period of fifteen years to students in Fergusson College. 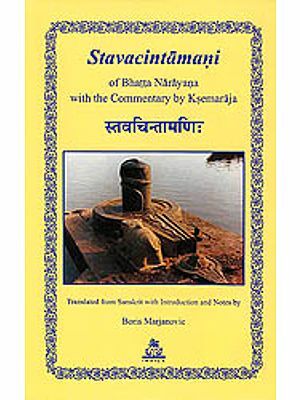 Mr. Masson has translated and annotated the Dhvanyaloka and the first chapter of the Locana for his Ph. D. thesis at Harvard. When we met we discovered a deep mutual interest in Abhinavagupta's Locana, the greatest Indian work on aesthetics, but a text so difficult that even the Pandits hesitate to teach it in the pathasalas. We began meeting twice a week for 3-4 hour sessions to read and discuss textual difficulties in the Locana. We soon found that we shared nearly identical views on the major problems in this work. Gradually most of the textual mysteries began to yield up their secrets, and we decided to translate the entire Locana as a joint work. 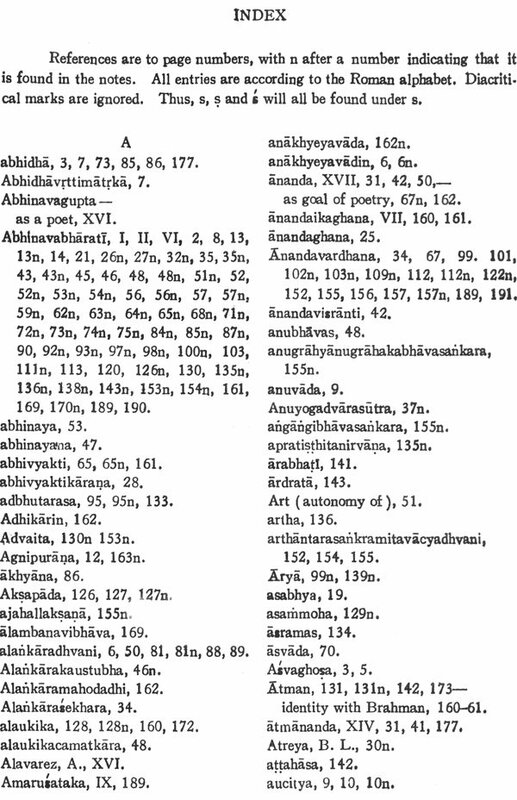 The section on santarasa was originally to have been an appendix to this three-volume annotated translation.But we found that so many issues in the Locana had a direct bearing on the problem of siintarasa that it really required a more extensive and separate treatment. 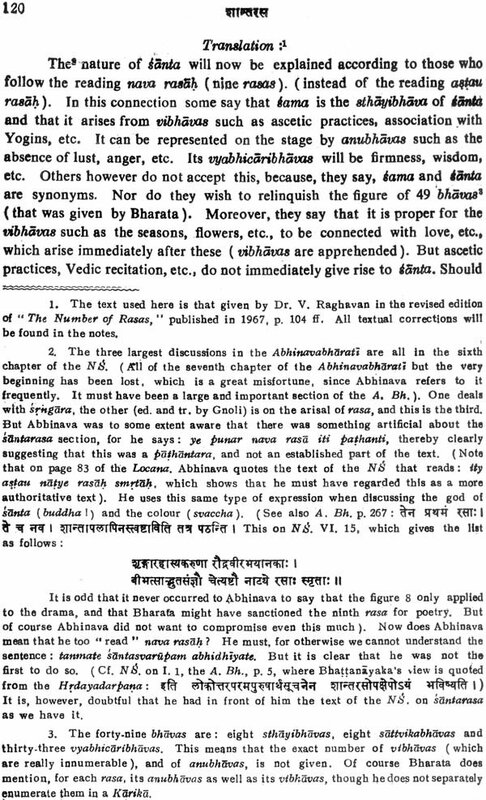 Especially in reading the santarasa passage in the Abhinavabharati, a text of notorious difficulty, we found that our readings in the Locana were a great help to its elucidation. 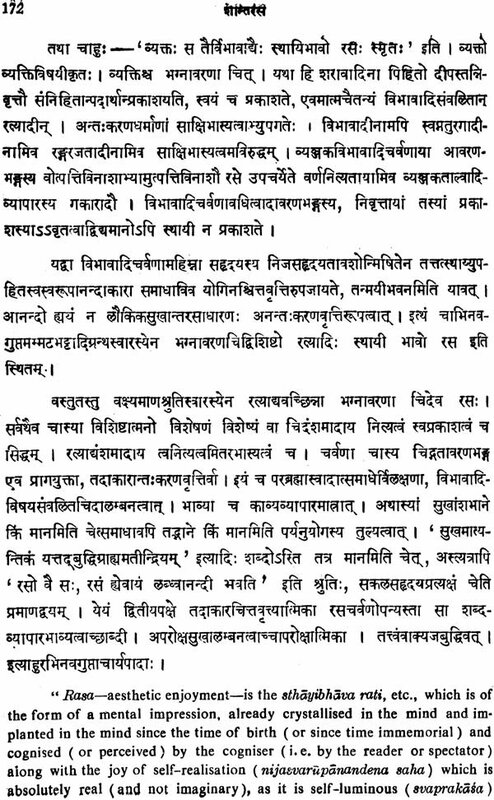 It is primarily as an aid to understanding this santarasa passage of the Abhinavabharati that we are publishing the results of our research. We regard this as an introduction to our translation of the Dhvanyiilokalocana which will be published along with the Dhvanyaloka in the Harvard Oriental Series. It is a pleasant duty to thank those who have helped us: Mr. Masson first read the Dhvanyiiloka with the late Professor L.Renou in Paris, who maintained a lively interest in Sanskrit literary theory and urged on him the necessity of doing serious work in this field. Professor V. Raghavan was kind enough to read with him daily the fourth Uddyota with the Locana. His pioneering work, "The Number of Rosas," and his magnum opus, "Bhoja's Sngaprakasa" provided much of the stimulus for writing the present volume. 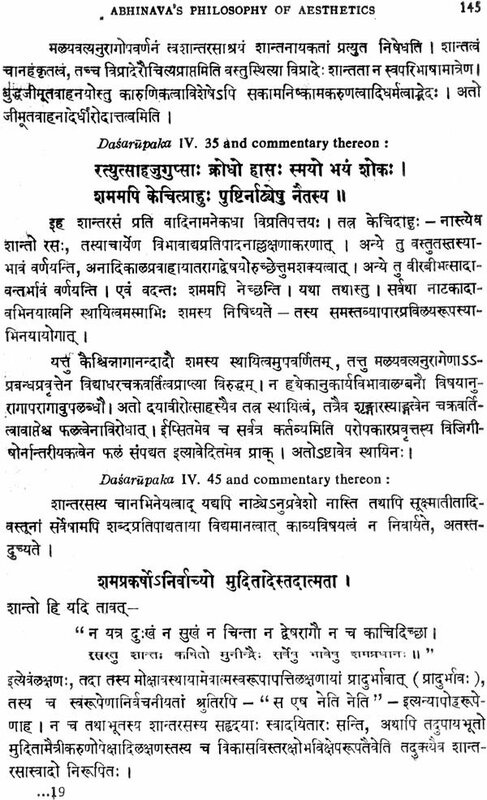 Professor D. H. H. Ingalls read Mr. Masson's translation of the first and fourth Uddyota of the Dhvanyaloka and made many valuable suggestions on method which we have followed here. Mr. Masson also wishes to thank his old friends, Professor B. K. Matilal of the University of Pennsylvania, and Professor K. Bhattacharya of the Centre Nationale de la Recherche Scientifique in Paris, for stimulating discussions over the past years on many of these very topics. Several Pandits of the Deccan College have always been very happy to discuss many of the issues with us. We wish to thank especially Dr. V. W. Paranjpe and Pandit Srinivasashastri for their help. Mr. R. P. Goldman from the Sanskrit department of the University of Pennsylvania helped us to clarify many of our ideas on Sanskrit and general literature while reading the entire work in manuscript. We wish also to thank Mr. J. Losty of the Sanskrit Department at Oxford University for reading' through the work and making numerous corrections in the English text, and for his pointed questions. Mr. Masson wishes to thank the A. I. I. S. for a fellowship from 1968-69 which made this study possible by supporting his research, during which time the present work was published .. It is a great pleasure to thank our good friend Dr. S. D. Joshi for his constant encouragement. Dr. R. N. Dandekar kindly accepted the work for publication in the B. O. R. I. Oriental Series for which we are grateful. We wish to thank Dr. V. Raghavan, whose work in Sanskrit poetics is well-known to all scholars in the field, for writing the foreword to this volume. A word on methodology: Philip Rawson in a recent article on Indian aesthetics writes: "In fact I believe that in the field of aesthetics ( as in the field of logic) a great series of thinkers who lived in India and wrote in Sanskrit between the fourth century A. D. and the thirteenth have put many ideas which must be brought into our present-day debates on art-ideas which we can use on works of art as one uses a can-opener on a can, to get at the meat. Their writings could extend our conceptual armoury." While we agree with the sentiment, we disagree strongly with the method. In an article subtitled: "A Study in Indian Aesthetics," there is no mention of a single Indian critic! 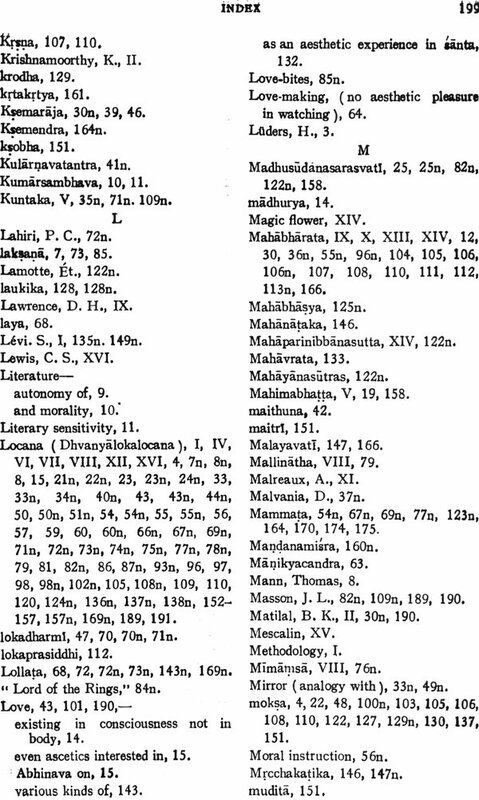 One could contribute an entire negative bibliography on Sanskrit poetics which would illustrate the same fault: an insufficient acquain- tance with the basic texts of Sanskrit literary criticism. 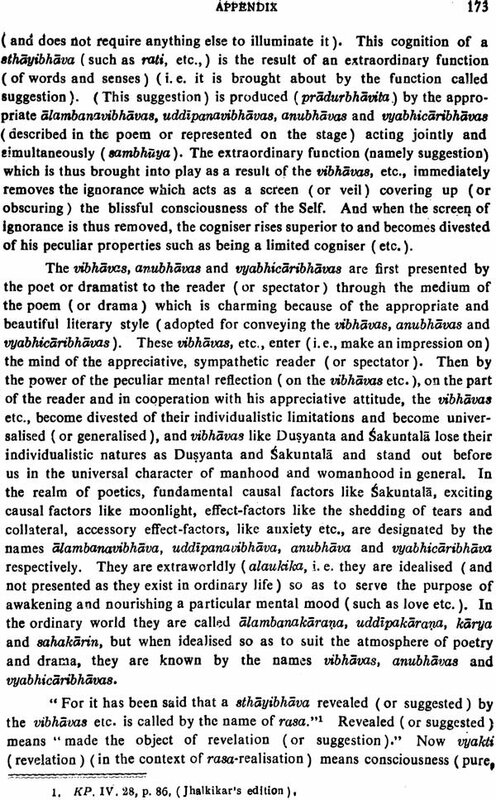 Instdad of vgue generalisations ( or reinterpretations such as are found in the special issue of the Journal of Aesthetics and Art Criticism on Oriental Aesthetics, Fall, 1965), we need detailed studies- and especially translations into modern English of the major works of Sanskrit aesthetics. 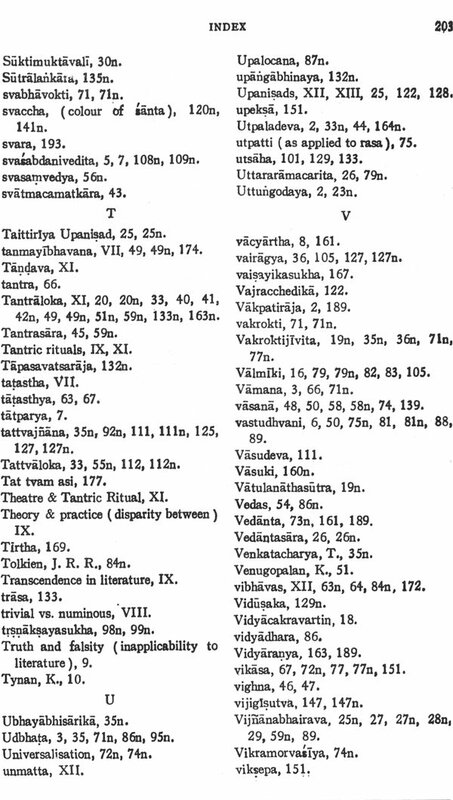 It is disturbing to think that there are no English translations at all of many of the most important works: the Vakroktijivita, the Kavyamimamsa, the Abhinavabharati, the Dhvanyaloka- locana, the Vyaktiviveka or the Rasaganga.dhara. 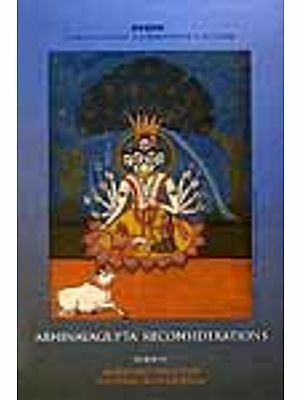 There is no readily availa- ble translation of Dandin, or Bhamaha, or Vamana, and Anandavardhana’s Dhvanyaloka is sorely in need of a new and better translation. We know that the Indians have creative ideas on such important issues as “the nature of poetic imagination," " the dichotomy between learning and inspiration,” “linguistics and poetics," "the tension between pleasure and didacticism,” “poetry and philosophy," "effort and spontaneity," and so on. But what exactly did the Indian writers have to say on each of these issues? We have taken up one of these issues, santarasa, for detailed discussion in this volume. Santarasa might be translated as "the imaginative experience of tranquil- Iity." It is an issue on which there exists some confusion. Edgerton was able to write, astonishingly, of santarasa: “... that it is forbidden to use it in the drama; it is inherently opposed to the very nature of the drama." This is a simple misunderstanding of the texts. Such misunderstandings arise because many modern writers are not taking the trouble to see just what the sanskrit writers on poetics have said. They are relying on secondary literature instead of going directly to the original sources. In this way errors only Compound themselves. How will one be able to appreciate Sanskrit literature properly if one is unaware of just what it is that a cultivated audience expected from its literature? And how can one know this, unless one reads Sanskrit literary criti- cism? 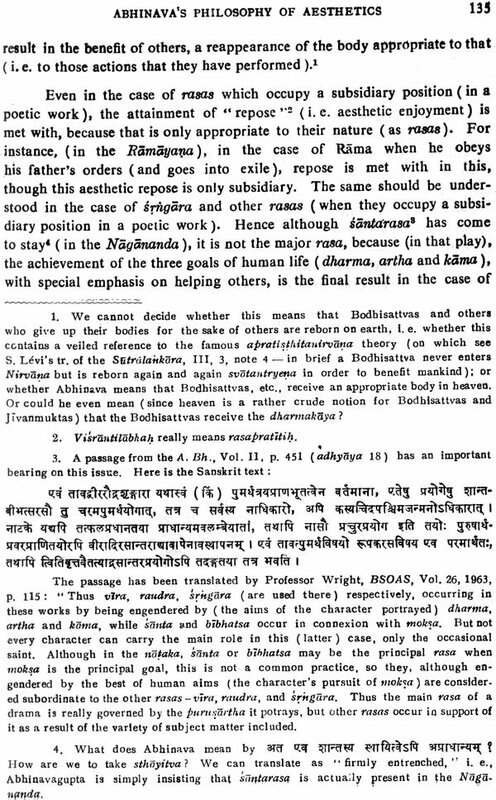 Here we must take sides in what seems to us a major issue COncerning the proper method of understanding Sanskrit poetry: Professor D.H.H. Ingalls has written of A. B. Keith, whose two works, " A History of Sanskrit Literature" and “The Sanskrit Drama" are standard reading in field,: " that for the most part he disliked Sanskrit literature." 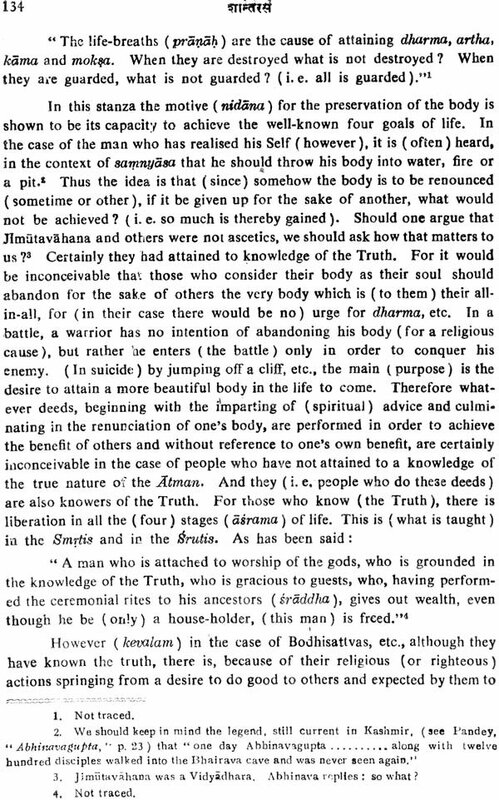 After illustrating this, Professor Ingalls remarks: "What is unjust in these judgements is that not once does Keith apply the remarks of a Sanskrit critic to any of the Sanskrit works he is judging" Professor J. Brough, a former student of Keith, responds to this criticism by quoting a paragraph from Keith's" History of sanskrit Literature," after which he remarks: "I have re-read this paragraph with close attention, but I have not been able to discover any hidden meaning in it; and I do not understand how such words could be written by one who ‘for the most part disliked .Sanskrit literature.' 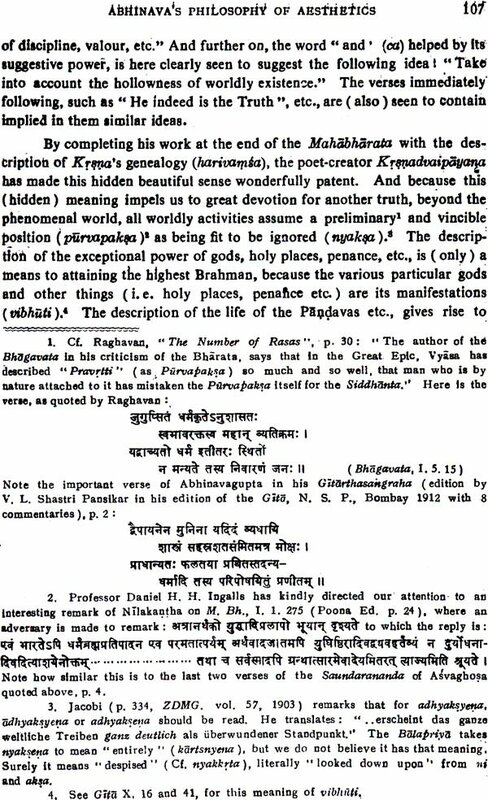 " Professor Brough may well be correct, for it is perfectly possible that Keith did in fact like much of Sanskrit literature. But surely this is irrelevant. 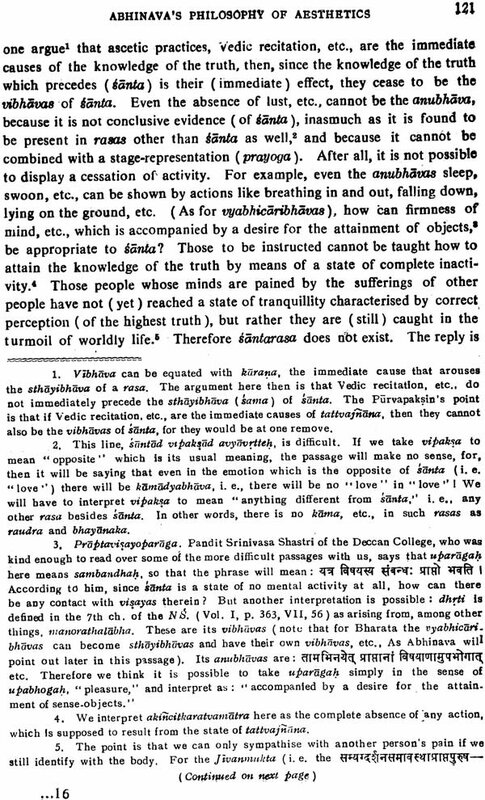 The point is not whether Keith did or did not like Sanskrit poetry ( since one can certainly understand somethine for which one does not have great admiration). but whether he Understood it or not . Brough dose not answer Ingalls’ second charge by far The more important of the two . Did Keith judge Sanskrit literature accord- Ing to the highly developed canons of its own texts on literary criticism? Judging from his chapter on the theories of poetry in ancient India, one would guess not. He seems for the most part innocent of their more detailed doctrlnes.! This is an important point of methodology. 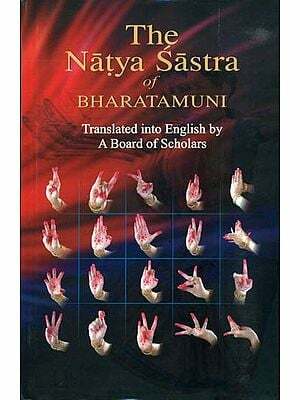 Before we can judge or even appreciate Sanskrit literature, we must understand it. As I. A. Richards often remarked to his students at Harvard: “We do not admire what we do not understand." 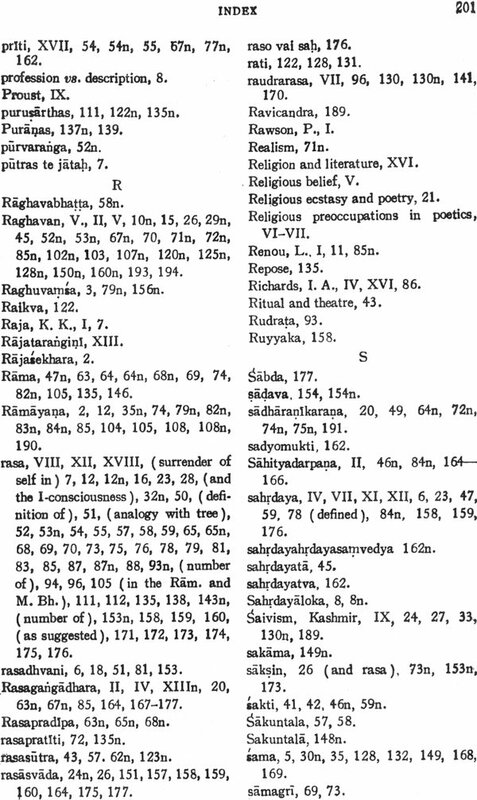 No amount of theory on methodology will help one to understand Sanskrit literature. There is only one method that counts: exposure to, and familiarity with the texts. There is a perfectly straight-forward use of the word "understanding" which is too often ignored in the elaborate treatises now fashionable on "methodology" ( often, it seems to us, merely excuses for not dealing with the texts themselves). 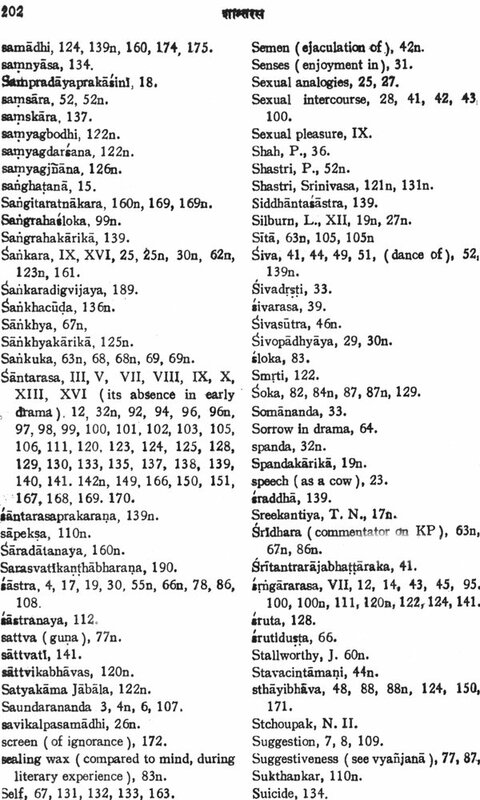 The difficul- ties of interpreting a Sanskrit poem are considerably less in India than in the West. 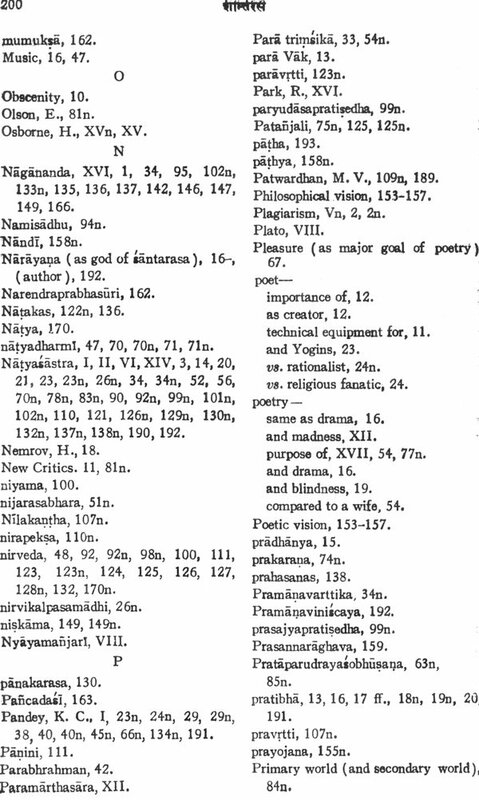 The meaning of a Sanskrit poem is rarely subjective. Either you have understood a verse or you haven't. 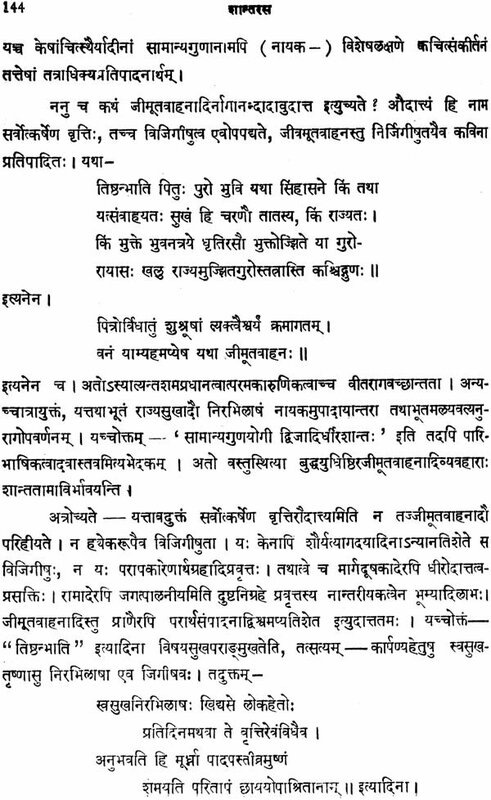 In a traditional Sanskrit class, the Pandit will ask a student after he has read a verse: artho jnato va na va, “Have you understood the meaning or not?" 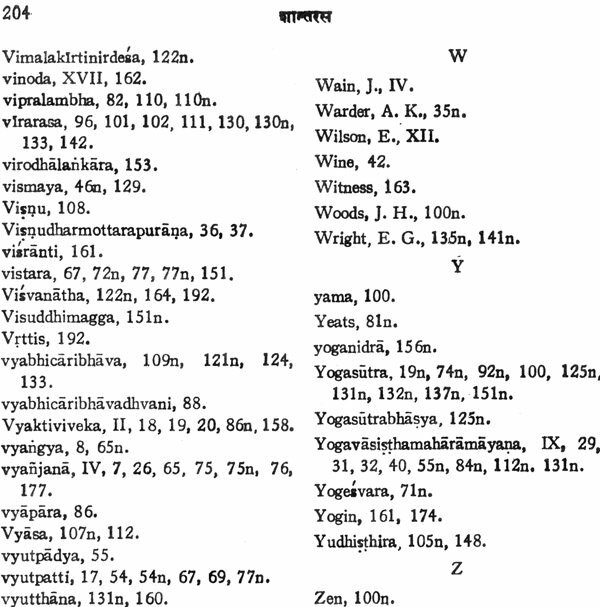 This makes it far more easy to reach a concensus about a poem's worth in Sanskrit than would be true in English literature. 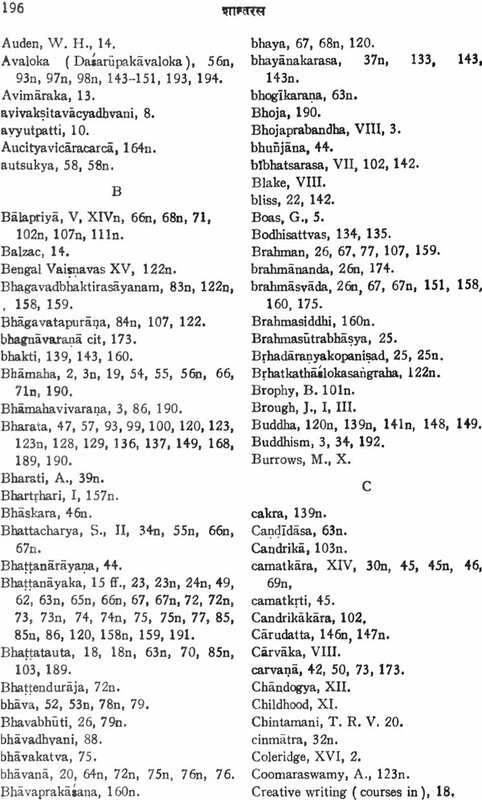 When we read a passage in one of these Sanskrit texts we know immediately whether we understand it or not. If we do not, no amount of “hmethodology" will give us instant and magic insight into the meaning. It is only by reading further in the literature that understanding will be gained.